The “Unitron History Research Project” has come a long way since we kicked it off as a result of our discussion on the Cloudy Nights Forum in September 2014. That is due in great part to the efforts of the dedicated classic telescope community, and your contributions, participation, and continued support for this project. As you recall, my initial hope was that individuals with information on Unitron and Nihon Seiko, and owners of the larger aperture Polarex and Unitron’s would take advantage of this site to pass on that information. Its success was once again proven based on the photos and information that Alex Boot passed along on both the Polarex-Unitron Model 900 and about Nihon Seiko. 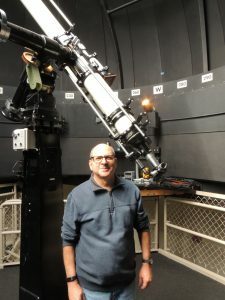 Additional details on the discovery, recovery, and restoration of that telescope are being covered under a separate Features Page, Polarex-Unitron Model 900. Overall, the classic telescope community has benefited from the information provided by Unitron and Polarex enthusiasts worldwide including: Australia, Belgium, Canada, Denmark, Greece, Italy, Japan, Netherlands, Norway, as well as from all over the United States. I expect this trend will continue as we expand our knowledge of these great telescope brands and as I complete the writing of the history in the three sections under the History Page: “The Glory Days”, “The Transition”, and “The Demise”. 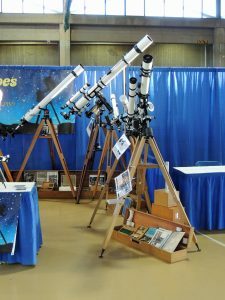 During this period I’ve also had the pleasure of meeting some great individuals who are also enthusiastic collectors of these fine telescopes, and had the opportunity to visit and/or observe through 6 inch Unitron telescopes in five locations including Texas, Arizona, Connecticut, Vermont and Michigan. For me these experiences have been the thrills of a lifetime! 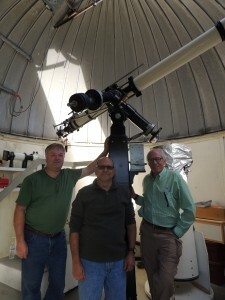 The star party at Rafes Urban Astronomy Center held in March 2015 was especially gratifying…as was the opportunity to work with the members of the Green Mountain Association of Amateur Astronomers – dedicated individuals responsible for taking care of the 6 inch Unitron at Castleton University in Vermont. 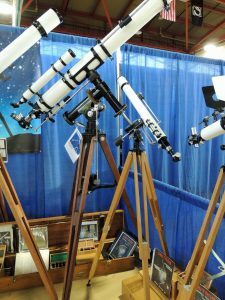 As an original owner of two Unitron telescopes, I have been an admirer of these fine instruments since first reading about them in Sky and Telescope magazine back in the 1950’s. With that as part of my motivation, I decided to take on as a retirement project the research and documentation of the history of the Unitron Company. I recognize there are some very good articles that document the history already hosted on various sites. However, it is my belief there is good justification to consolidate this information in an effort to provide a more comprehensive and detailed history. It is also my belief there are good sources still available that can provide personal insight into the company, but time is running out to take advantage of these sources. This website is intended to serve as a means for those sources to provide that information not only on the history, but hopefully on some of the hidden large aperture Unitron and Polarex telescopes. What a wonderful resource for these amazing telescopes. We Unitron aficionados are indebted. Thank you. I loved my Unitron for decades, in all due respect to Meade; Celestica which I also have. I would love to meet and perhaps get a few of us together in the Albemarle area where I live. Call 4342937485 if interested in keeping Unitron alive! Dear friends, I’m in México City, I have collected for years Polarex-Unitron Telescopes and accesories and I’ve got almost all models except the five and six inches, as many of you I have always sought the six inches and this website is fantastic it allows us to enjoy these beautiful old instruments. In my search for the six inches here in México I got in a University a beautiful old six inches Goto Telescope with all accesories, pedestal and astocamara original. 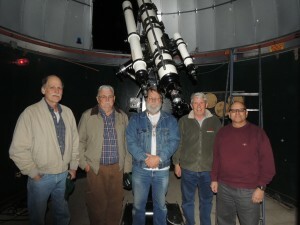 I am also in México City and “was” very enthusiastic about Astronomy and Telescopes. yes we still have it. it is its own cupula and was in was in good shape, at least two years ago when I used it..
we stay in the SAMs building in the Parque Xicotencatl in the Alamos Colonia not far away fron Calzada de Tlalpan nearest Metro Station Viaducto. short walk to park. 6 blocks away..
we meet there mondays at 8:00 pm mostly. Thank you for this great website. I sent some information to you via the unitronhistory2014@gmail.com address concerning the picture I found in a 1969 publication of a 6.0″ Unitron on the roof of Villanova University in Pennsylvania. Its current location/condition is unknown but I might just do some digging and find out. I just read the Steve Franks Interview; Very interesting ! — it fits nicely with my own impression of the role of Unitron as a primarily importing, marketing, repacking / selling and distributing agency. 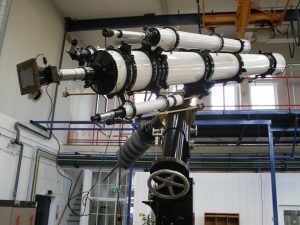 Looking forward to your posting of the other announced interviews, and hopfully to your next step of researching the role of Nihon Seiko in the design and production of these telescopes in Japan (I realize that won’t be easy though). As refractor and Unitron fan, i appreciate a lot your nice project. Well done & congratulation! Wonderful site with much information about the history of Unitron/Polarex/Weltblick/Mercurius. I’ve got almost all models 40mm -102mm and still have a 75mm alt-az which performs fantastic. Thanks for this resourceful site. Wish you luck on locating those precious 6″ gems. It is a honor to have my Polarex NS-131 displayed in your gallery. Now I know that the “Meridian” was a small firm, owned by a man called Björn Hedvall. Björn Hedvall (no longer alive) was supervisor for the public observatory in my town Gothenburg. The observatory (a tiny shelter from 1929, placed in the city park) was equipped with one 6 inch tube together with a 4 inch guide scope. All his refractor scopes were from Unitron/Polarex (Nihon Seiko), but marked “Meridian”. My scope was equipped with one 65mm/900f scope and a viewfinder 8X 30mm. But I sold the guide scope (I didn’t know how rare this scope was). I regret that big time now! Am aflat aceasta pagina, dupa ce am cautat despre Unitron History Project pe Google. I found this page after I searched on Google about Unitron History Project. I have a 4 inch Unitron telescope with a Unihex eyepiece. It has an alti-azimuth mount and I was wondering if there is a way to motorize it so that it could automatically track objects like newer types of telescopes can. I have owned a 3″ altazimuth in mint condition for about 30 years. I’m getting ready to retire, and I have been searching for a 4″ altazimuth for several years. Would you accept an offer to purchase your 4″? It galls me to say this but when I was a teen-ager, I did own a lovely 2.4″ altazimuth Unitron that, unfortunately, was stolen when we moved and in all the confusion, I did not realize that the theft had taken place until many months after. I was very ill at the time and once the theft had been discovered, I did not pursue the culprit which would probably not have been very hard. I hope, at least, that the thief got some pleasure out of the scope and simply did not steal it with the hope of reselling it. I have always regretted the theft, obviously, but even worse, I feel like an idiot for not pursuing the thief and recovering the telescope. I now own a Televue 4″ refractor which is a lovely instrument but I can never think of my old Unitron without a pang of regret. The scope was a birthday gift and at that time, which was 1965, the scope was priced at a measly $125.00. We moved in the early 1970’s and so I was able to get some use out of it and as you might expect, it performed superbly. I hate to think what the scope is worth now but someday, I hope to replace it but like I have already said, the cost must be, by this time, prohibitive. In any event, if the price is reasonable I would not completely rule out the idea of replacing it. But that might be too much to hope for. If anybody has this scope and is willing to sell it, maybe you could quote me a price and perhaps we can come to an agreement. I figure its worth a try! Thank you so much for putting all this information together. I got an Unitron 142.3 model that belonged to my grandfather and I had some doubts about assembling it after so many years, since he was the one to get it ready to use when I was a kid. I was amazed to see that you have even the manuals. Again, thanks a million. You are very welcome! The 3 inch is a great scope. I’m certain you are going to enjoy using it. 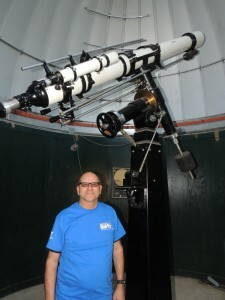 Dave my friend you have created a wonderful depository of not only Unitron history but of the world wide subculture of passionate Amateur Astronomy . Our passion not only covers looking at these stars but often to the nomenclature of the wonderful equipment that it takes to get there !Thanks for your effort Dave and all the people that helped you along your way ! I`m also own one! (a small one) : “Unitron” 6,5 And I Love It! …..And i allways Will! …. (Promise that)…. What a great site! I had a 3″white and grey unitron telescope which I bought in pietermaritzburg, south Africa,in I’d guess about 1979?a little later I equipped myself with a red tasco 6″reflector (about 1981).even then the difference in the quality of the unitron vs tasco was notable.the unitron had a fantastic high quality finder,the tasco a tiny plastic lensed finder with a baffle right behind the front lense which must have given it effectively 10mm of apeture! sadly I long since gave both scopes away. I Have one of Those Wonderful Telescopes….a 6,5 /900 mm:s Beauty! ….Just Great! A nice Unitron 760 is now listed on eBay. Seems to be an attractive starting price of $285.